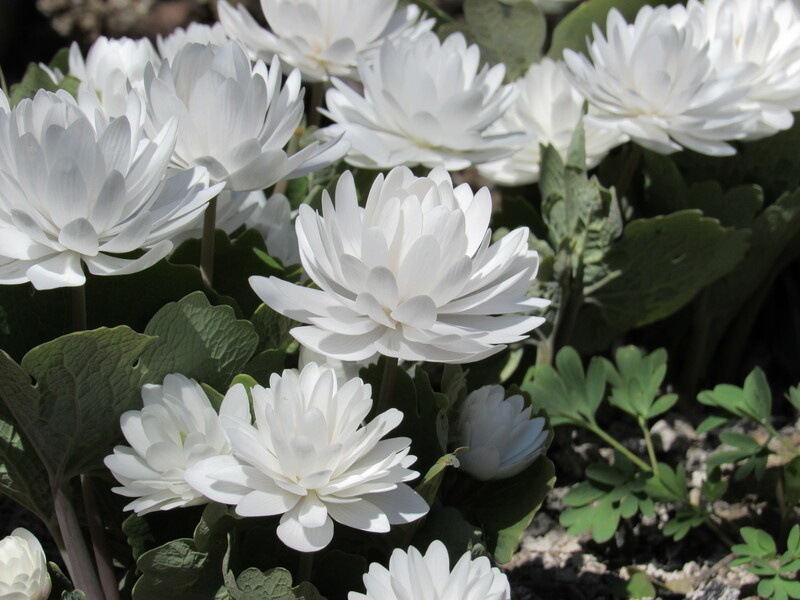 While working out in the display gardens, I can’t stop gawking at this double bloodroot(Sanguinaria canadense f. Multiplex). 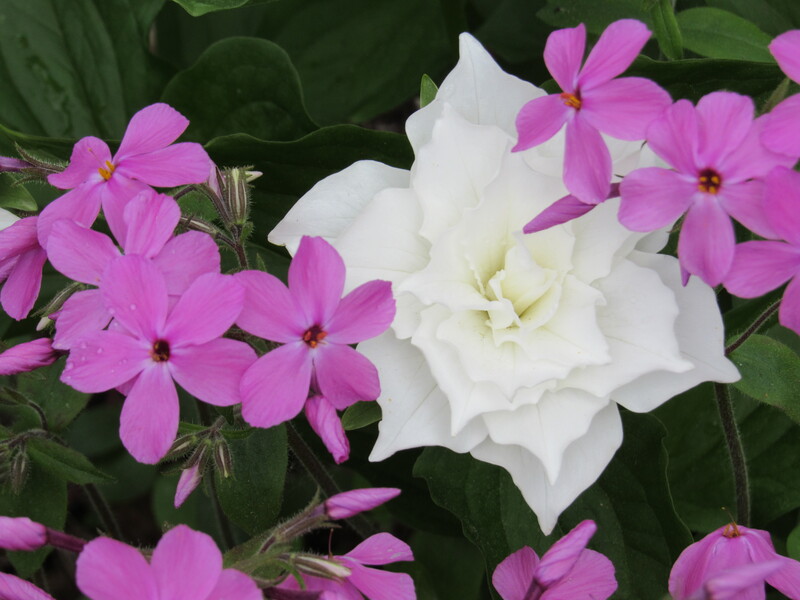 Its double flowers are a result of a naturally occurring mutation. Instead of having pistol or stamens, these parts are replaced by flower petals. Because of this, the plant is sterile and will not set seed.The plus side is that the blooms hold longer without this plant’s energy going into seed production. 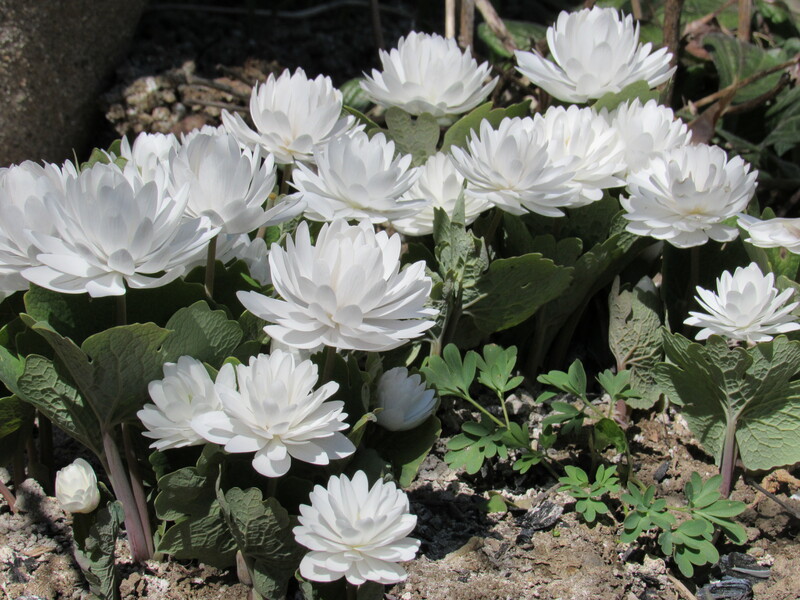 The blooms of single flowering bloodroot (Sanguinaria canadense) often only last for a few days. Bloodroot, in general, is a good plant choice for areas with tree root competition. It can tolerate drier soils and it’s bright white flowers really create a statement in the early woodland garden. Bloodroot is a North American native perennial found growing in shaded, moist, well-drained ( or dry) woodlands. Bloodroot grows to about 6 to 7 inches tall. It’s light green, palmate, lobed, basal leaf is wrapped around the flower as it emerges and opens as the flowers blooms. 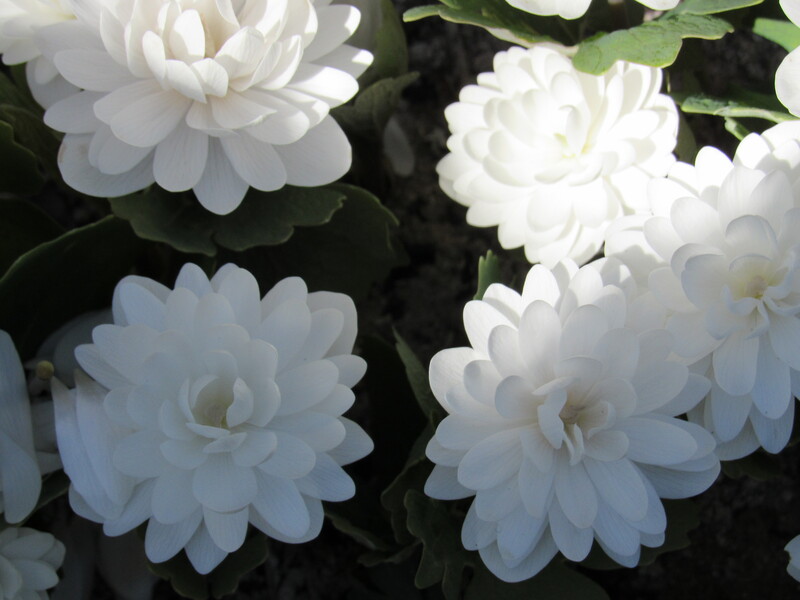 The stem of Bloodroot is often reddish when mature and topped by a single white flower consisting of 8 to 12 petals ( unless it’s the double form), with a bright golden center. Bloodroot gets its name from the plants thick root tuber.These thick but tender roots contain a red juice that can stain your skin. Bloodroot has been used medicinally, though with a very careful application and in small doses. As an expectorant and respiratory stimulant, it has been used to treat bronchial problems and severe throat infections. A poultice of bloodroot can be used to treat skin disease, warts, tumors, ringworm, and will even act as an insect repellent. However, bloodroot should be considered toxic and not edible, an overdose in its application can be fatal.Not a plant one should feel at ease going out to harvest and use as a medicinal unless very skillful in preparing (and applying) herbal or homeopathic remedies. Perhaps it’s just better to enjoy this plants wonderful visual attributes…you won’t be disappointed. 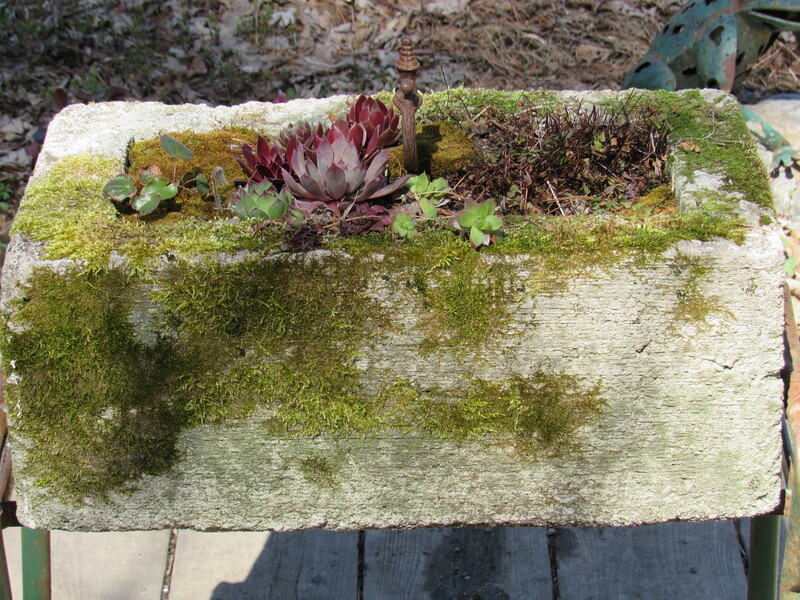 We’re offering another hypertufa building class here at Fernwood on Sunday, June 12th, from 1:00 to 3:00 in the afternoon. This time, we’ll be learning to construct a vessel using a mold. 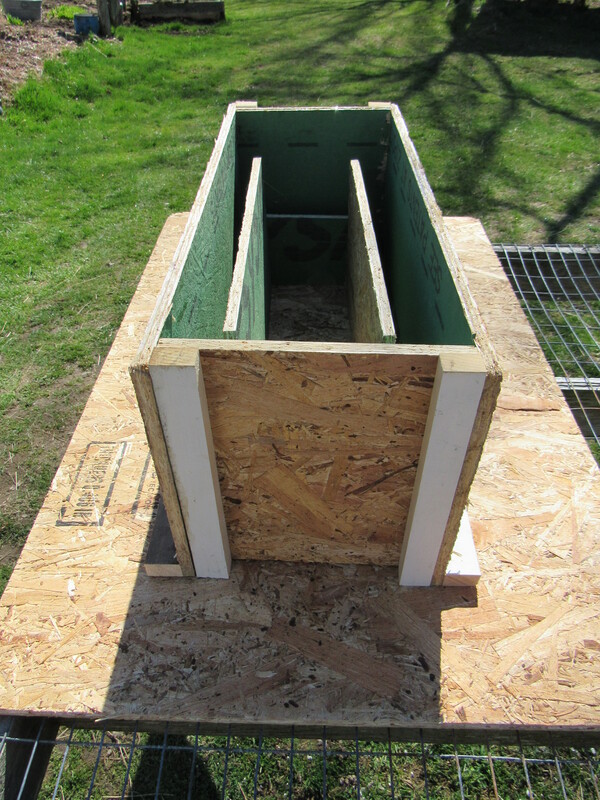 Instead of the free-form method we have taught many times in the past, we’ll be providing the mold for you to make a medium side rectangular planter. The mold and the materials will be included in the class…and you get to take home your mold to use over and over again! Come join us for an afternoon of learning and building! And of course, scones and tea will be served. If you’d like to know more about hypertufa you can check out this post. All information regarding this upcoming class can be found on our ‘classes and more’page. My very good friend who was preparing a meal for her family to celebrate Passover called me from the big supermarket in town. She was standing in the meat aisle looking at chicken livers. Apparently the ‘big store’ chicken livers looked a bit pale and she was considering what kind of additives were included in a 1 pound package of commercial chicken organs. From what she described, they didn’t look too appealing and let’s face it… if you’re going to eat organ meat, then eat good, healthy, organ meat. From the store aisle, she decided to call me while thinking, “I bet Denise has some chicken livers”. Of course, we have chicken livers! I told my friend to come on over and get what she needs, but to please come before 9:00 a.m., we have a group coming to walk the gardens. “Can you leave them in the mailbox?” she asked. 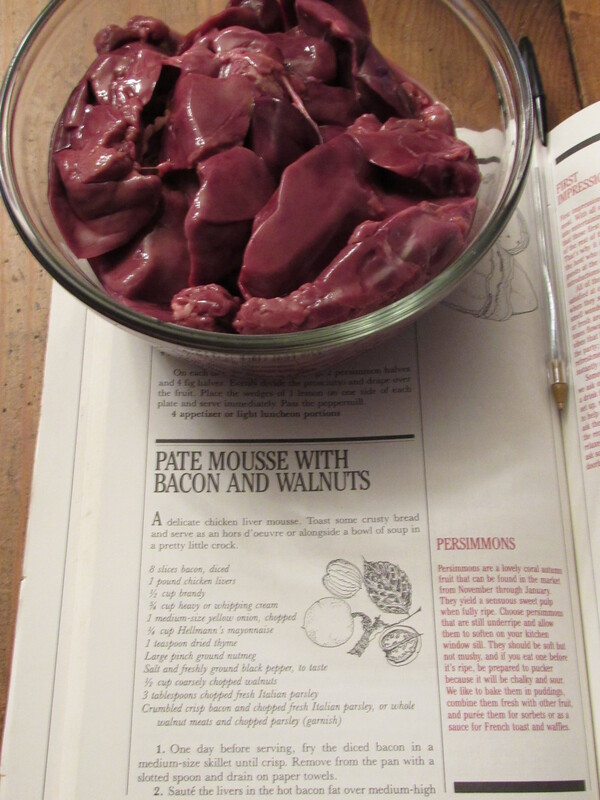 Of course, I’ll put them in a container with some ice (the chicken livers were frozen). She quickly shared the recipe she’d be using passed down from her great-grandmother. We spoke about the journey different cultures have travelled to get to safe shores, so often leaving so much behind. Family recipes were at least one thing people could take with them, and here was Cathy, several generations forward making use of this family heirloom…a Passover dish made with chicken livers. My great joy is that I live in a place where diversity is celebrated, that my friend can call me to see if I have any extra chicken livers, and that it doesn’t seem strange at all to leave them in the mailbox. Does anybody need chicken livers? there’s still more! Still Time To Start Writing! There are still three spots open for our writing class in May, check out the info and dates below…. If you recall, we offered a writing workshop here at the studio this past February. It was great! The class was taught by Linda Buckmaster, who is an amazing writer and teacher…you can read more about Linda’s credentials below. Everyone who took the class really enjoyed it. 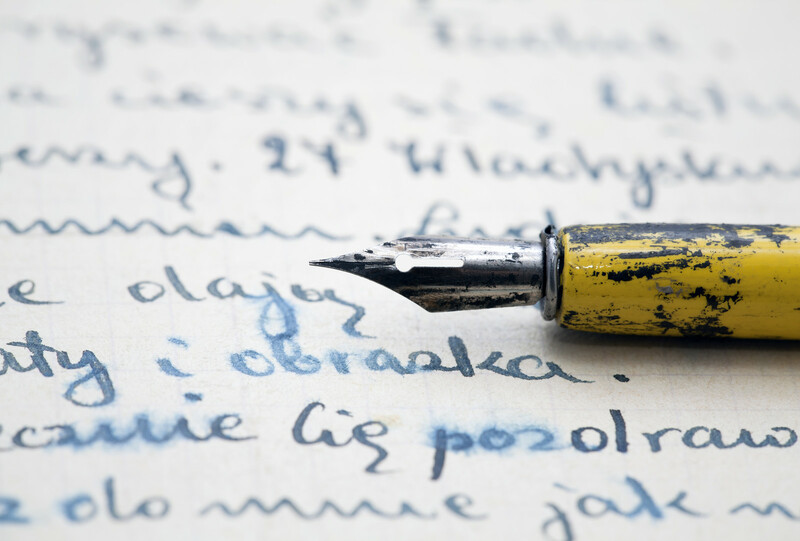 There were all levels of writers, some who were interested in writing memoirs, some who wanted to get started on writing a children’s book, and others who simply wanted to improve on their own personal journaling. At the end of the two sessions, each participant agreed that Linda had helped them to improve on their own style of writing. And, everyone was inspired to write more! Writing about place includes any of the elements that make a specific place what it is. It can include the layers of history, the natural world, human culture, and the built environment across time to bring us to this present moment. We can be advocates, critics, or lovers. By developing our craft, we can better understand and present our world and experiences. We will take advantage of the May weather and the beautiful setting of Fernwood for inspiration. · Open to writers or aspiring writers of any level who will write new poetry, prose, or beyond genre. · We will discuss readings on craft and the work of other writers for inspiration. · Through writing exercises and prompts, we will practice the writer’s toolkit of image, voice, language, structure, and more. We’ll maintain a safe, supportive environment that recognizes there is no such thing as a mistake in writing, just the next draft. Instructor Linda Buckmaster has taught this popular course in multiple community venues in Maine. She has over thirty publications in regional and national journals and three poetry chapbooks. 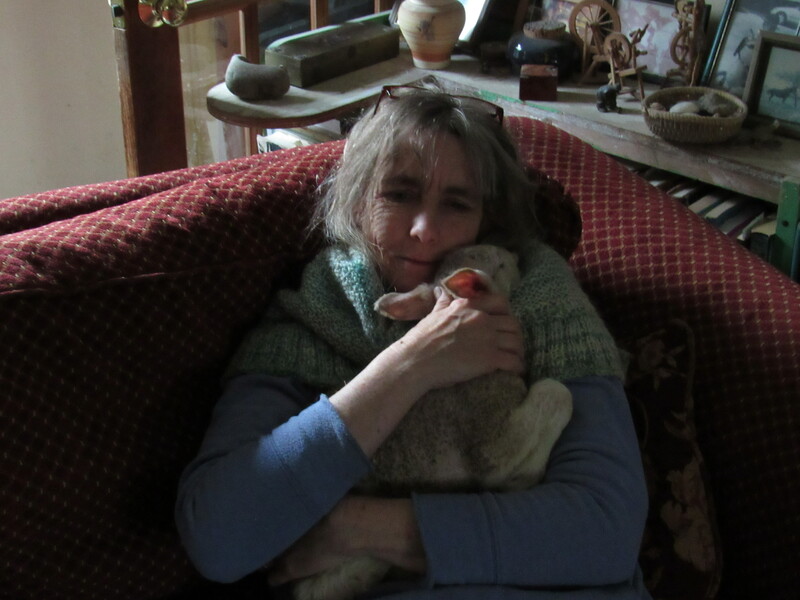 One of her pieces was named a Notable Essay in “Best American Essays 2013.” Former Belfast, Maine Poet Laureate, she has taught in the University of Maine system for twenty years. She holds an MFA from the Stonecoast writing program at the University of Southern Maine and an MA in Communication from the University of Maine. She was awarded writing residencies in Newfoundland, Oregon, Vermont, Portugal, Florida, and on Kezar Lake in Maine. As we prepare for the season here at the nursery, filling pots and tending to gardens, the first plants to emerge and bloom are keeping us company.These tough little plants are flowering while so many others are just beginning to send up an indication of new growth. 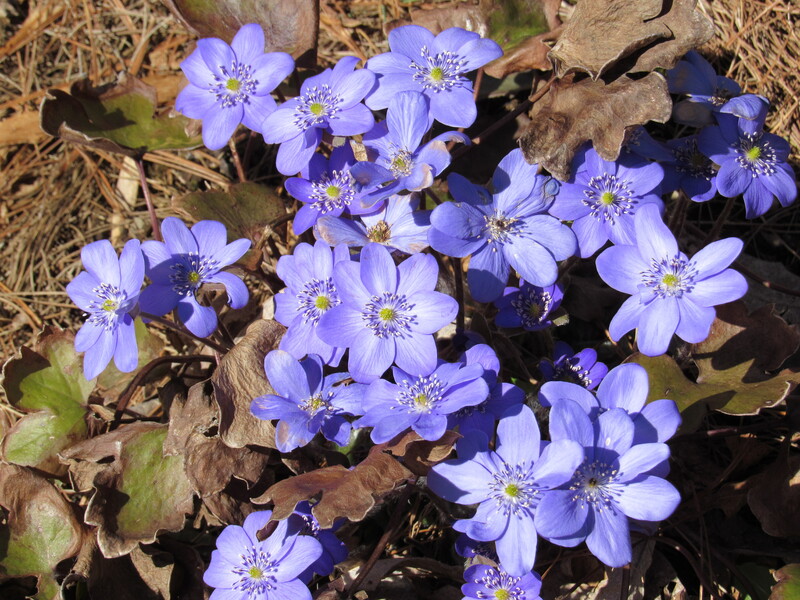 Hepatica nobilis with its deep blue flowers are quite striking against the still somewhat drab landscape. 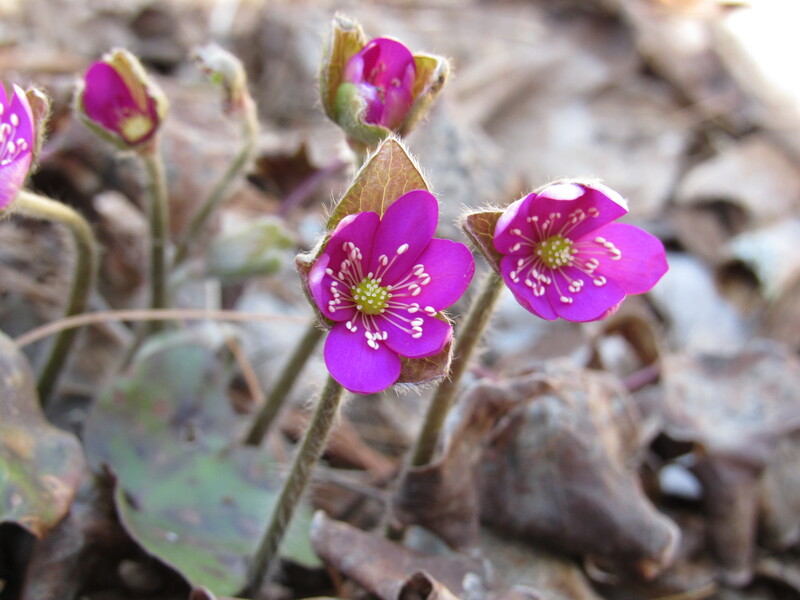 The leaves of Hepatica are evergreen, with the onset of flowers, last year’s leaves will start to brown and fade making way for the new leaves, these will come as the plant finishes blooming. 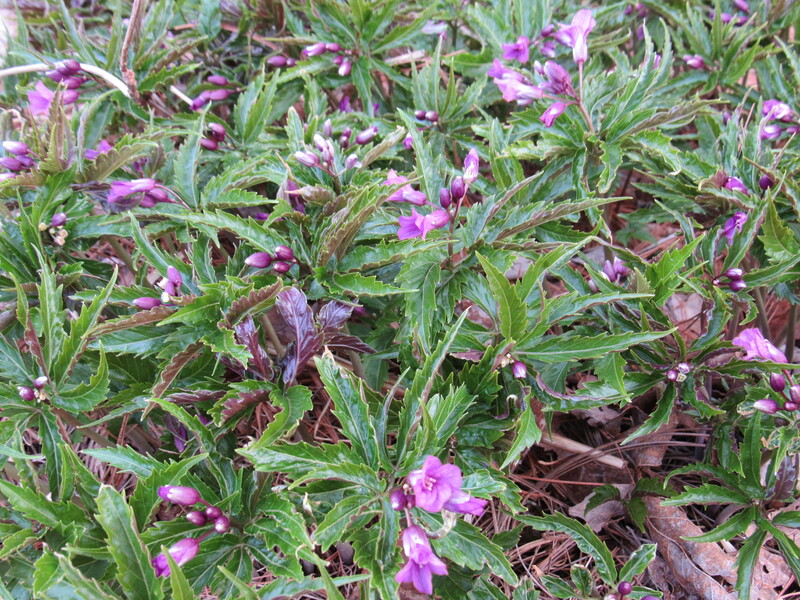 Cardamine glandulosa forms a nice clump of purplish green foliage and a deeper purple flower, it too is courageously blooming at the moment. 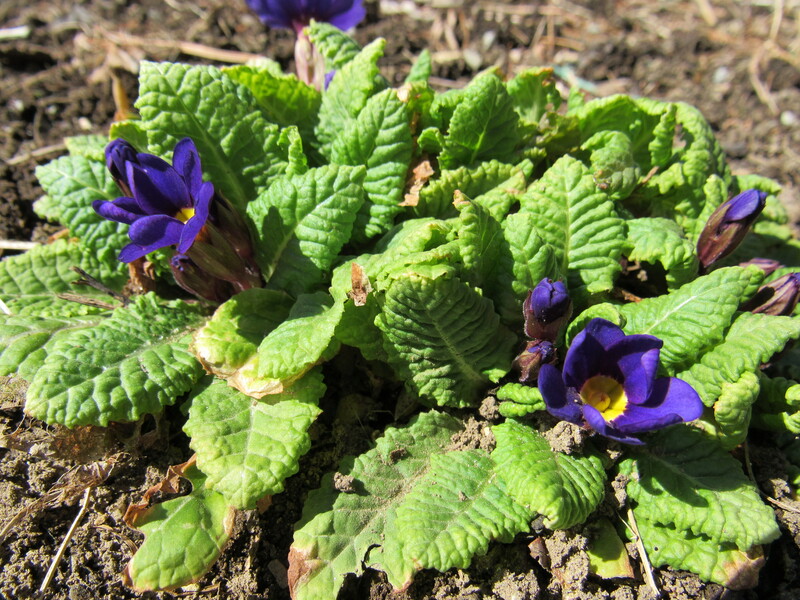 What I am loving the most right now are some of the primulas that are flowering among their deep green and crinkled foliage. 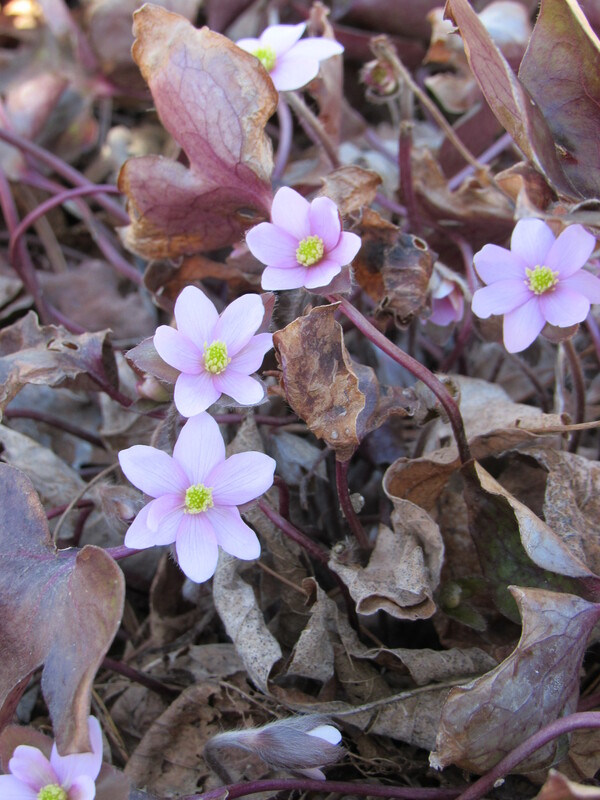 Here are few more photos of what’s currently blooming in our spring gardens…. On Saturday, we will be giving a talk on the ‘early risers’ and ephemerals that grace the gardens during the early days of spring. The class is full, and we are grateful to be sharing information and a view of the gardens at this time of year. Please remember our opening day is Saturday, April 30th…..see you then! Our current house guest? This little gal who likes to stretch out underneath the table after her breakfast. Why live in a barn when you can be among hosts who feed you, give you an extra blanket at night, and are happy to have you snuggle in their lap? Itty Bitty, as we call her, has things pretty well figured out! Happy spring, happy gardening to all! 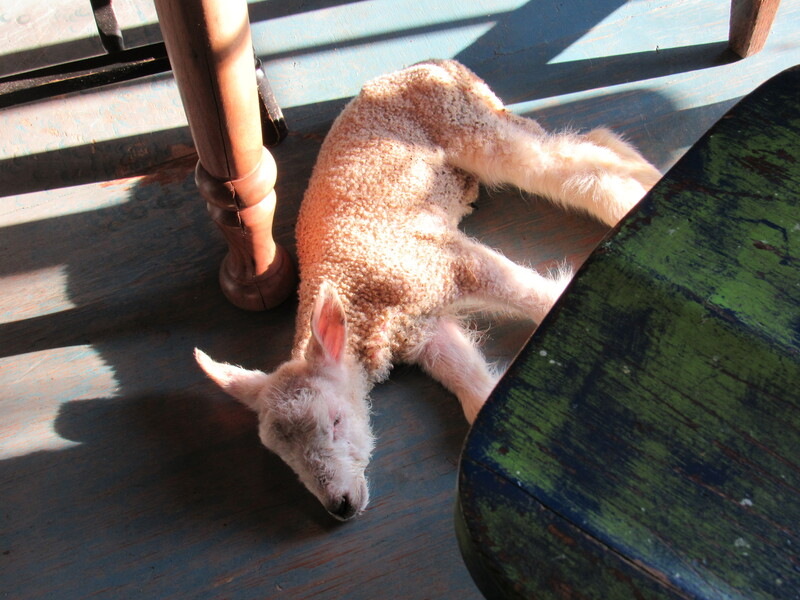 During our 1 a.m. lamb check we found…. 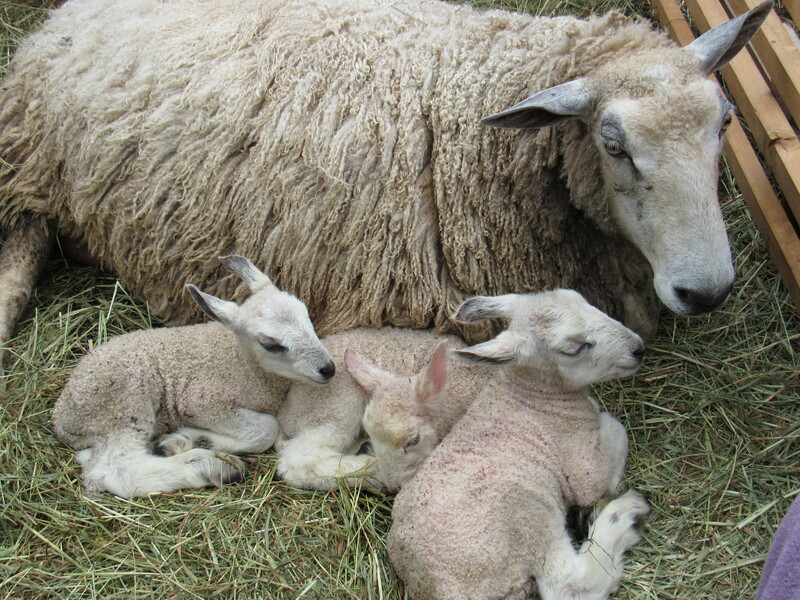 not one, not two, but three little lambs snuggled together, licked clean and with their bellies full. Their very proud and efficient mama was lying close by, not the least bit ruffled from just having delivered triplets! Senecio aureaus, ( renamed Packera aurea) is a plant we love and grow here at the nursery. Two common names for Senecio are Golden Ragwort and Liferoot, the latter referring to its long history in medicinal use. An indigenous perennial, Senecio is in the Asteraceae family and is hardy from zones 3-9. 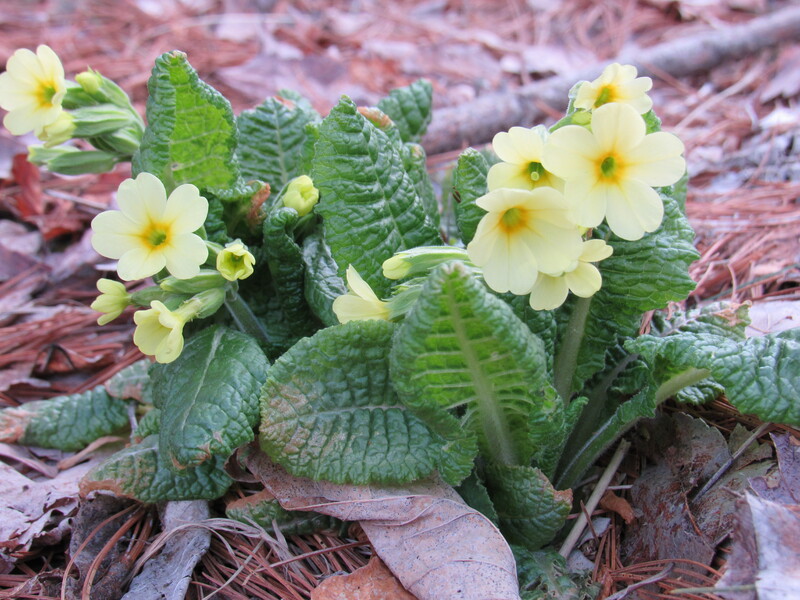 It prefers moist soil and a shady location. Here in Maine, earlier in warmer climates, it blooms in late May to early June and holds its blooms for an extended period. We find it to be a great native flower for attracting butterflies and pollinators. 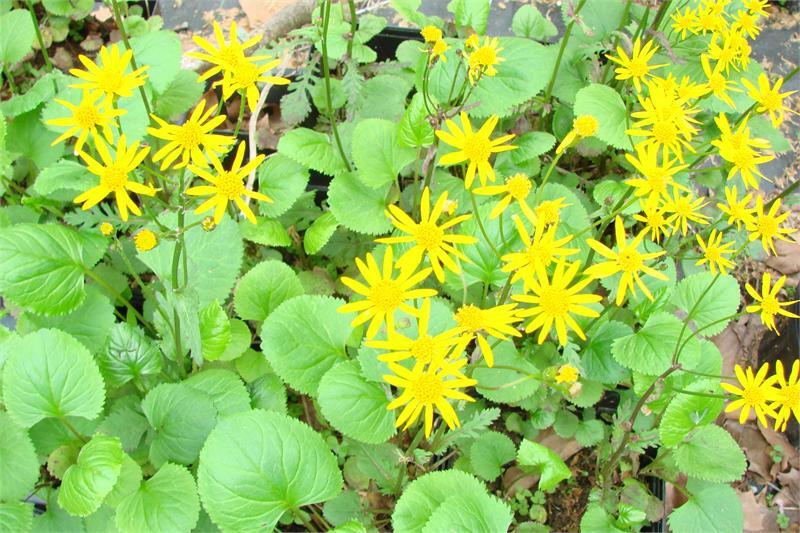 The deep golden yellow daisy-like flowers grow atop sparsely leafed stems that are 1-2 feet tall. At the base of these stems, lie the shiny heart-shaped evergreen leaves. 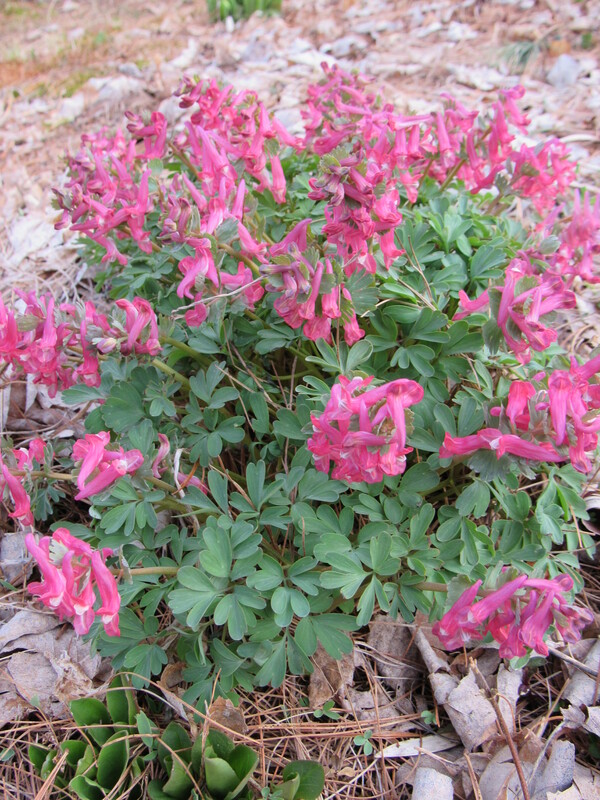 This basal foliage can remain an attractive ground cover year round. It naturalizes through self-seeding and by underground roots creeping horizontally and forming a large colony. 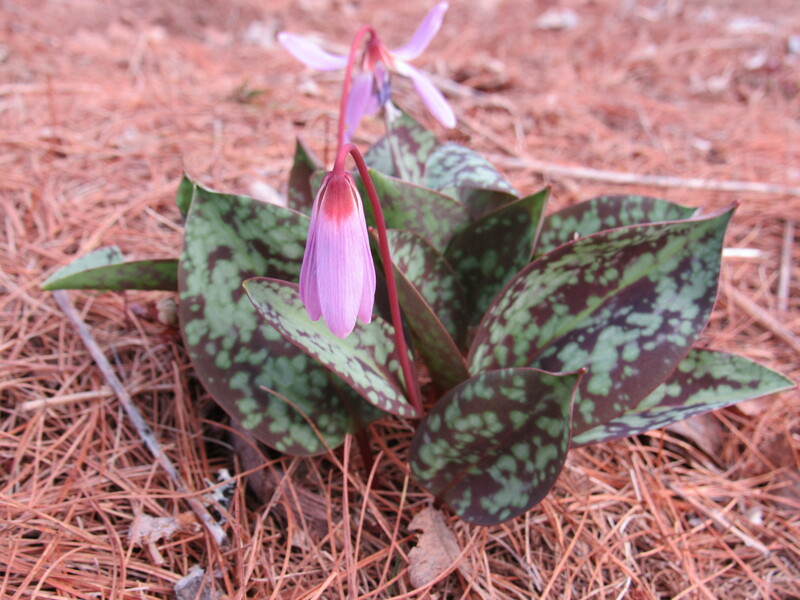 We are always surprised at how quickly this plant spreads, a great choice if you have a large area you’d like to cover. We have also used this plant in small applications, in other words, you can include it in a mixed perennial bed. As a medicinal plant, Senecio has had an important role in Native American medicine. It has been used to treat colds, hemorrhages, and as a diuretic. Senecio is a plant that has most often been used in herbal or homeopathic preparations that can help to regulate menses and to aid in any gynecological issues….it promotes menstrual flow, helps to strengthen reproductive organs, is used to treat urinary infections, acts as a natural birth control, as well as helping to relieve pain during childbirth. Though it has longed been used in the application of natural remedies, a bit of caution should be used. I myself do not tincture this plant. It is still used in professionally prepared homeopathic remedies. Like many plants, Senecio contains a naturally occurring alkaloid called Pyrrolizidine. Pyrrolizidine has been shown to produce toxicity to the liver ( hepatotoxicity), especially in grazing mammals. Because of this, most mammals or animals avoid it. This particular alkaloid in plants is used as a defense mechanism against herbivores that may feed on it. Some insects, however, are fairly resistant to its effect and actually choose plants containing these alkaloids. By chewing on leaves that contain pyrrolizidine they ingest the chemical into their own system, thus helping to ward off their own predators. Gardners should not be alarmed by the fact that Senecio contains these alkaloids, they naturally occur in the chemical composition of many plants (like comfrey and borage) and are really no threat to the home gardener. I am fascinated by the ability indigenous people had for understanding the methods used to extract these alkaloids and resins and to incorporate them into their remedies. Pretty amazing knowledge! When coming to the nursery this spring, be sure to check out Senecio aureaus, it may be just the plant you’re looking for.